Nikon D3200 @ 35 mm f11 x 1/2s. Although I enjoy many genres of photography, nature photography is my primary passion with street photography being a reasonably close second. I find myself equally moved by the works of Weston, Adams, McCurry and Maier. But that’s me, I suppose a topic for another day. When you step back from it all for a moment and contemplate the bodies of work from all four you see two distinct types of images: those that are previsualized and those that are not. Both approaches can yield outstanding photographs, but the approaches behind the lens could not be more different. With careful attention to detail as you pass through the landscape you can become adept at both. When I am in nature photography mode without a specific composition or subject in mind, in other words in search for images that are not previsualized, I try to make sure that three key elements are aligned so that I may be able to produce something meaningful. If I return without images I chalk it up to being a great experience outdoors and move on. Its not a failure. And certainly one should not beat themselves up over such a thing. The first of those three key elements is light. Without good light its hard to produce quality photographs. Be patient, study the weather and aim to be out when the Sun is not so intense. A good rule of thumb is the hour before and after Sunrise and Sunset. Rules can be broken so keep an eye on the weather and jump on the opportunity for good light outside those windows. This point struck me in the Fall of 2017 on a day I took to photograph the autumn leaves. I arrived at my first location an hour before Sunrise and was greeted by a nearly Full waxing Moon adding fill light across the scene. Fall colors at night. As the Sun rose that day some light clouds and fog moved in and allowed me to continue photographing for about eight more hours. It was my most productive day of photography to date and I returned home exhausted with hundreds of images several of which are now in my portfolio. I broke that golden hour rule with lucky weather. Be a student of the weather and its impact on your light. The second key element in this more candid approach is mindset. This is, at least for me, nearly as critical as light. There have been instances where I have been in good light but was unable to ‘see’ the landscape due to the storm going on within my head. You either need to compartmentalize the chorus of distracting thoughts or intentionally get yourself into a more conducive mindset. Meditation, if you will. I do not compartmentalize well, so if I have other weighty things on my mind I know ahead of time it will be hard to focus on much photography. That keeps me home more than I would care to admit. Sometimes getting out there is all it takes, the experience of nature just places you in the right mindset. Sometimes that does not work. Other people use music as a trigger or meditation. Both work very well, but for me just setting things aside, listening to some calm music on the drive to the trail head and focusing on the experience is good enough. The hike in is typically sufficient if my head is clear. I am not an earbud person, but some photographers swear by it. Consider shutting notifications off on your devices, one message can be thoroughly derail you. Truth told, I love listening to the silent sounds of the wilderness so I embrace being unplugged and unreachable for a few hours. All of this said, the third key piece is preparation. Your kit needs to be together, at least somewhat organized and in ready to go condition. Not much will ruin your efforts faster than a missing battery, memory card, step up ring or tripod. Camera? That beautiful hike in, your peaceful mindset and the fantastic light will all be largely for naught if even one important piece is missing. If the weather or life keeps you from getting out, then take an at-home photo expedition into your camera bag and clean the lenses, sensor, body and filters. Charge the extra batteries while you are at it. Accidents happen and things do get left behind from time to time, but with close attention to the details you can largely avoid most of the pitfalls. Ever wonder what its like to be waist deep in a swamp searching for a nonexistent spare intervalometer battery? In short, its not fun. I now keep two in LowePro my accessories pouch all the time. We might need to talk about that swamp story another day, too! Unplanned shots can and do happen and some of the most memorable photographs that have ever been produced were not visualized ahead of time. Steven McCurry’s “Afghan girl.”, Thomas Mangelsen’s “Polar Dance.”, and Galen Rowell’s “Rainbow over Potala Palace” all come to mind. Frans Lanting’s Okavango Elephants at Twilight is another. But previsualization of images also has its place at the table and can be equally productive. I keep a list of potential photographic subjects that I have run into in four places: a formal spreadsheet file, my camera roll on my cell phone, a notepad in my car and in my head. Other than the spreadsheet, its not organized and I am fine with that. The point of it is that it’s a running list of places and things that I would like to return to under better light. A list of things that I thought would make a great image if only I knew what it was trying to say to me. Some I will return to, others I will not. Once its on the list, though, it does tend to call me back. 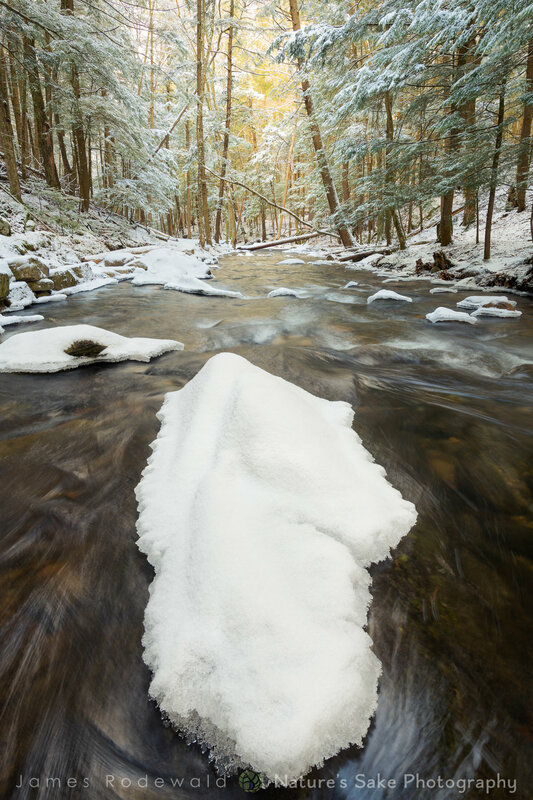 A stream may only be good for a few weeks each year, a cove may only look great at Winter, or a boulder may only work well when the Sun is at a different angle. It’s a difficult thing to pin down, but if a subject is speaking to you give it some thought. Grab an image if it does not seem to be the right time and think about how it may shift over time. The next logical step would be to write it down in some way, mark it on a map even, and make a point to return. Some subjects will be there when you return, others just won’t due to their ephemeral condition. An example of an unplanned image. This scene with the warm afternoon light was stumbled upon. Recent snow had created the opportunity and combined with afternoon light I had predetermined that something might occur along this stream that I had noted earlier in the Summer. Nikon D850 with 14-24 f2.8 @ f11 x 1s, focus stacked. The process of determining how light may change at a given spot over time could not be easier today. There are two cell phone apps that I use for this, Photographer’s Ephemeris and PhotoPills. Both are excellent apps and are highly recommended for outdoor photographers. There are extensive tutorials on these two tools online, so take a solid look. Essentially what these two apps let me do is figure out where the Sun, Moon and Milkyway will be at a given site over time. When over the course of this year will the Sun rise along the axis of this lake? When will the Moon set in the valley between these two hills? What time is Sunrise along that beach in August? The Milkyway image included here is a good example of this methodology. I first encountered this scene in the Spring of 2017 once the ice had receded. I really enjoyed the perspective and it was void of any distracting light sources like houses and street lamps. I came back a couple of times and grabbed some images of what the sky would look like in the future with PhotoPills’ Planner “pill”. 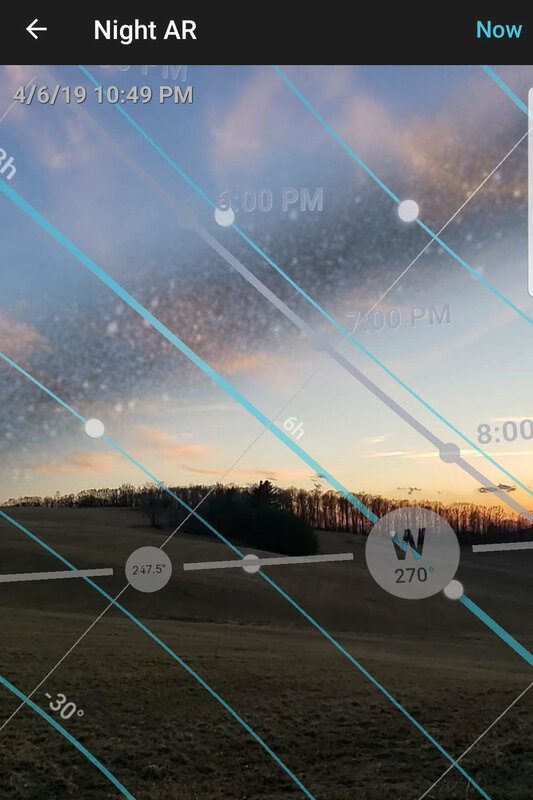 This feature allows you to see what the sky will look like over time superimposed onto whatever your Smartphone’s camera is pointing at. I wanted to time a shot of the Milkyway emerging vertically out of the gorge. Some screen shots and then some patient waiting until just the right night arrived later in the Summer. A Moonless sky on a star filled night finally arrived and I ventured out there standing chest-deep in the murky water. This was a significant amount of planning and waiting for a photograph, the complete opposite my Winter stream image. I could have composited the shot, but that is not something I do in my artwork. Cell phone scouting image from June 14, 2018 at 4:10 PM. I liked the composition but I was not wearing waders to venture out into the water for an uncluttered view. Screen shot from PhotoPills on June 14, 2018 at 4:16 PM looking forward in time to June 17, 2018 at 2:51 AM. The Orange dot represents the Millkyway core and at approximately this time it approaches vertical between the hills. Finally on July 14, 2018 at 1:47 AM there was a decent window of time and clear skies to attempt to capture the scene I had visualized the month before. Seeing it move into position in absolute darkness was one of the most peaceful experiences of my life. Not another soul was around! One of the key features of this approach, at least for me, is that I need to venture out into unfamiliar places with an open mind and look for scenes or objects that may make interesting photographs. I usually end up doing this when the light is not really conducive to image making. Scouting can actually be an exhausting process, often draining you of creativity after sticking to it for some time. It’s a productive process, though, as it can yield some very compelling images if you are truly mindful of your surroundings as you do it. As you move through an area for scouting purposes its helpful to keep some notes or at least a healthy roll of snap shots followed-up by notes at the end of the journey. I would also recommend keeping the tripod stowed away, if you use it for the purpose of taking snap shots with your camera it will be too time consuming and will limit your awareness of your entire surroundings. The tripod can shut down your creativity very quickly, especially if you are searching for compositions. I have scouted the location where the Milkyway shot was taken several times and have a list of other ideas for that area. This is a great location as there are multiple perspectives that work, at least from what I recall looking at my notes and snap shots of my last journey out there. So even though the light may not be agreeing with your objective to shoot at any given time, be mindful as you move through that landscape as you might stumble upon something that compelling for a later date. One of the processes I go through when scouting a new location is getting a good orientation of the land and where the Sun and the Moon will be over time. Scouting shots of the area are definitely a help, but add to those images some screen shots from Photographer’s Ephemeris or PhotoPills. You can recreate the location in Photographer’s Ephemeris at any time, but its helpful to just do it at the scene as you may discover something really interesting that possibly worth hanging around for. This occurred during my most recent shoot at a new location. After Sunset I took a few survey shots with PhotoPills and noticed that the crescent Moon would appear in the West in a few minutes. I had not noticed it behind some clouds, but by hanging just a little longer I managed to get it into the scene once the clouds passed. All of that material was not previsualized as I just described, but the notes I took during that shoot certainly will be helpful in the future when I return under more ideal conditions. Scouting image of some agricultural land via cell phone in low-light conditions. PhotoPills imagery from the same location looking forward in time to around 11:00 PM that reveals the Milkyway arcing across this valley to my immediate right. Whether you are out in the field chasing a scene you have already planned or you are just arriving to a place to see what good light might develop, great images can be achieved. Both approaches are equally valid. There are numerous tricks to both approaches, I have only described here the ones which have worked for me over time. If you find yourself leaning towards one method over the other, give the alternative method a try. It may add to your proverbial bag of tricks or it may be utterly distracting to you. Consider the apps, they can make a huge difference. Regardless of which method you utilize, try to bare in mind the three key components I described earlier. Good light makes all the difference, preparation ensures you might get the shot should it arrive and mindset will open your consciousness to the most compelling compositions. Good luck out there! I would love to hear your thoughts. What works for you out in the field? What makes the difference in your imagery? Feel free to comment below.